How to setup and flight an Ad Campaign. Ad Campaigns are a great way to build and maintain exposure for your event. Event Ad Campaigns make it easy for you to market your event. They are typically used for retargeting your event's site visitors or email lists. Ad Campaigns offer the ability to track the users who see your ads and report on total number of impressions, clicks, and conversions. After logging in to your Feathr account, navigate to and click 'Events' located in the left sidebar. Click 'Ads' under the event for which you wish to add a campaign. Choose the type of Campaign you'd like to create from the dropdown. Campaign Name: This name is used for internal identification purposes only, but we recommend naming it something easy to remember regarding which Segment you're targeting and why. For example, "Web Attendee Prospects Early Registration Push". Event: The event will already be populated for you. Campaign Duration: This is the date window of when your display banners will be served. Destination URL: This is the URL of the page a user will be taken to when they click on an ad. *Note: You have the option to choose unique URLs for each creative in the Creatives section. Once you've filled out the basic information click 'Target' to move on to the next step of selecting which Segments you'd like to see your ads. On this step, you can add any number of targets you want for this campaign. 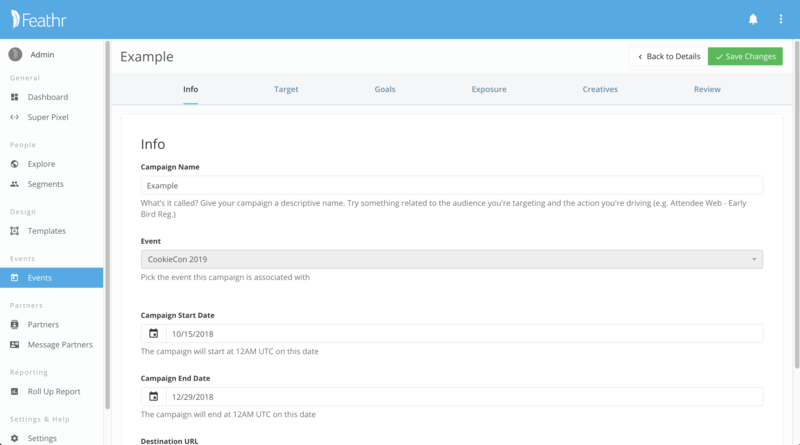 The targeting type is based on what type of campaign it is. Excluded Segments will not see ads from this campaign. This is ideal for preventing users who have completed Campaign Goal from seeing unnecessary ads directing them to perform an action they've already done. For example, exclude your registered attendees from campaigns where the ad banner directs them to register. Read more about Excluding your Registered Segment here. Now that you've selected who will see (or not see) your ads you can add an additional filter to limit your campaign to only be seen by users who are in specific geographic areas. Geographic is currently the only available filter. Find your Geo Filter by typing the name of the city, state or country you wish to include. Select your Geo Filter, but be careful! If you're searching for a city or state, make sure you select the right filter, as some cities share names with cities in other states and states share names with cities and countries abroad. 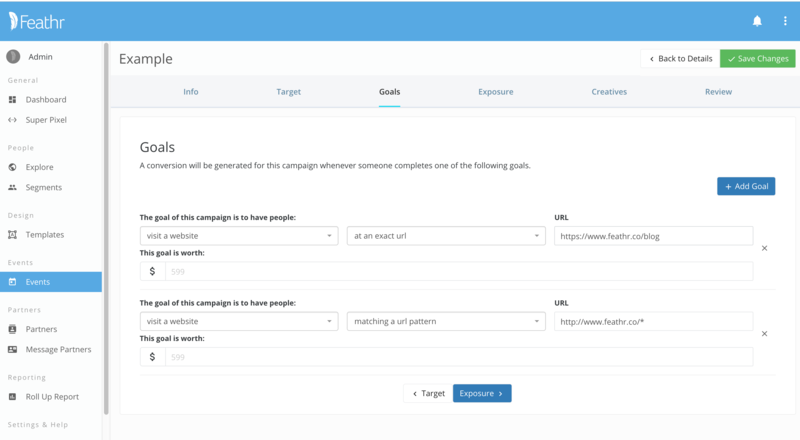 Click 'Goals' to move on to set how conversions will be measured for this campaign. Campaign Goals are how you let Feathr know what this campaign's goal is, and how to measure its success. Click here to learn how to create a good Campaign Goal. Your Campaign Goal should be the segment that a user joins for the first time when they complete the desired action your campaign is driving. For example, if your campaign's Primary Purpose is attendee acquisition, then your goal is for your target Segments to register for your event. So, your Campaign Goal is your registered attendee Segment. 1. Click an ad from this campaign: the easiest of all goals! A conversion will be counted for anyone that clicks an ad shown from this campaign. 2. To Fill out a Form on a Website: A conversion will be counted for anyone that fills out a form on a specific Feathr page. 3. Visit a Website: A conversion will be counted for anyone that visits a selected web page. You can select an exact URL or just put in a URL pattern with a wildcard(*). 4. Enter a Segment: A conversion will be counted for anyone that enters a previously created Segment. If you have created a segment in the 'Segments' section of the app, you will be able to choose it from the dropdown menu. Set a Value. The value you set is used to calculate your estimated campaign ROI. It can be the price an attendee is paying to attend your show, the average cost to exhibit, or the value you attribute to attendees of your free-to-attend event. Click 'Exposure' to move to the next step. 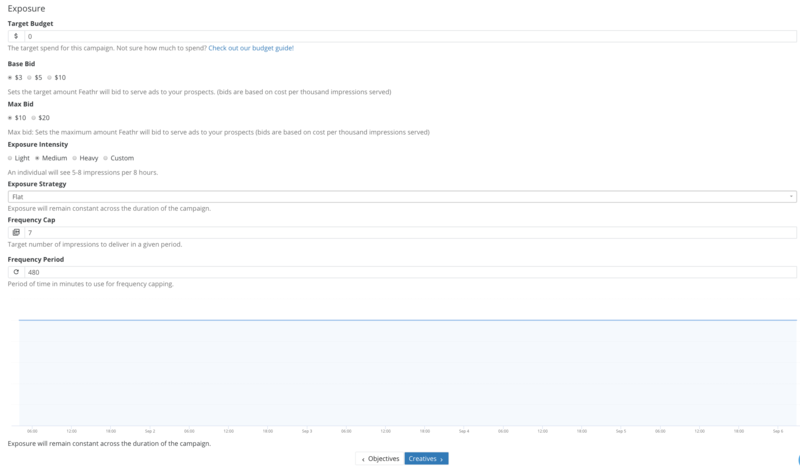 The Exposure settings determine how often the users in your Target Segments will see your ads, and how those impressions and your budget are distributed over the length of your campaign. For a more in depth look at the different Exposure settings, have a look at this article about selecting the right Exposure Intensity and Exposure Strategy for your campaign. Type the amount you want to spend into the Target Value. Don't include any commas or periods in the amount or your campaign will not sync. The value shown, either budget ($) or impressions, is based on the the type of campaign that you are creating. Retargeting campaigns will have a value based on budget ($) while Partner campaigns are based on impressions. Select your Base bid. Your Base bid determines the target amount that you would like Feathr to bid to serve your ads. You have the option of choosing either $3, $5. or $10. Bids are based on cost per thousand impressions served. Select your Max Bid. Your Max bid determines the maximum amount that Feathr will bid to serve your ads. You have the option of choosing between $10 and $20. Bids are based on cost per thousand impressions served. Enable or Disable Auto Optimization. This defaults to 'Enabled' and we recommend leaving it on. This allows Feathr to adjust bids according to which ads and websites are performing best, so your banners are shown to your Segments where they're most likely to engage with them. Select the Exposure Intensity for the campaign. This is the number of times per 480 minutes (8 hours) one cookied user will see an ad for this campaign. Select the Exposure Strategy you want to apply. Flat campaigns will spend evenly and show the same total number of impressions each day of the campaign. Ramp up will start by serving fewer overall impressions, but will steadily increase spending and the total number of impressions shown each day as the campaign runs. We recommend this for deadline driven campaigns that have a clear end date, like early-bird rate expirations and large, inexpensive shows that have late registration patterns. Ramp down will start a campaign with more daily impressions and higher spend that will steadily decrease as the campaign approaches its end date. We recommend this exposure strategy for brand awareness campaigns that target new user audiences, like lookalikes or search segments, in advance of registration drives. Focused takes into account that there are dates you may want to focus engagement around without immediately ending your campaign when that date passes. 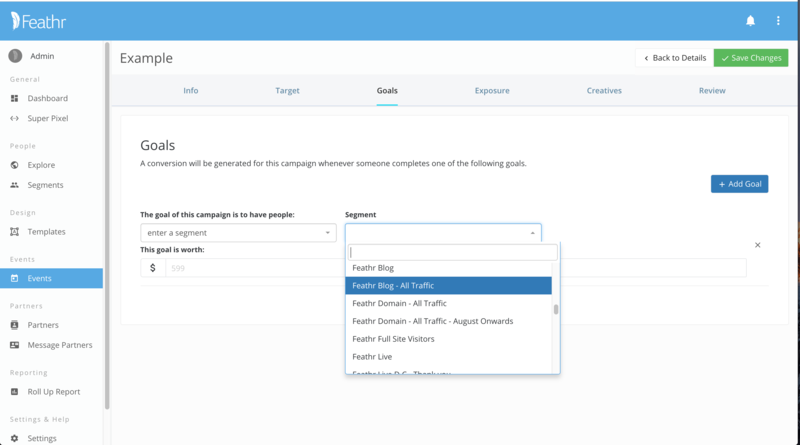 This option gives you the ability to tailor your campaign around an important date while still touching users before and after. Select your Frequency Cap and Frequency Period. The Frequency cap determines the target number of impressions given during a Frequency Period. Now on to 'Creatives' -- You're almost done! Creatives are the images that are shown to your Target Segments in the form of banner ads. Click here to view a list of Feathr-supported Creative Specs. Add a creative by clicking '+ Add Creative'. You can upload Image or Video creatives as well as AdTags. 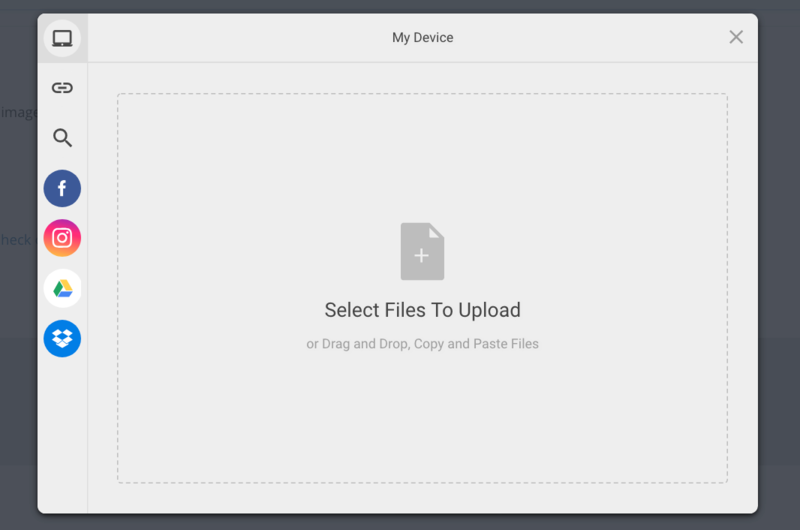 Drag and drop in the files you want to include in the campaign or select them from the files on your computer by clicking 'Choose Files'. If you keep them hosted on your server you can link to their URLs. When you've selected all of your files click 'Upload' to add them to your campaign. Once your creatives have been uploaded you'll see them displayed on the Creatives screen. You can add a unique Destination URL for each creative or move on to review your campaign. *Note: The Destination URL defaults to the original URL you set at the beginning of the campaign process. You may choose to add a different Destination URL for each creative if you are using UTM codes to track individual creatives or A/B testing different landing pages. Otherwise, just leave the destination URLs blank, and it will default to the one set in the first step of the campaign. Now that your creatives are uploaded and your Destination URLs set, click 'Review' to make sure all your information is correct. Take a moment to review all of the information, settings, and creatives you included in this campaign. If something is wrong, take a moment to go back and correct it. If everything is correct, click 'Finish'. Congratulations! You've successfully added an Ad Campaign! Check back in a couple of hours to see all of the impressions and (hopefully) conversions you're driving! Why does my campaign still say "pending?" A campaign will say it's pending until it reaches 500 impressions. This can take a few hours until the campaign really gets going. If you chose a campaign start date in the future, the campaign will still appear as pending until it reaches 500 impressions on the day it is scheduled to start. Don't worry if your campaign still says pending, but it isn't scheduled to start for another 2 weeks. If it still appears as if your campaign is pending after 24 hours of your campaign start date, reach out to [email protected] or your dedicated Customer Success Manager to look for any issues. Another reason for a campaign to appear as "pending," even if it has been running for a few days, is that your targeted segments may be very small. For example, if you are targeting less than 1000 users in your campaign, it will take some time before the ads are able to reach all of those users, depending on their online activity. 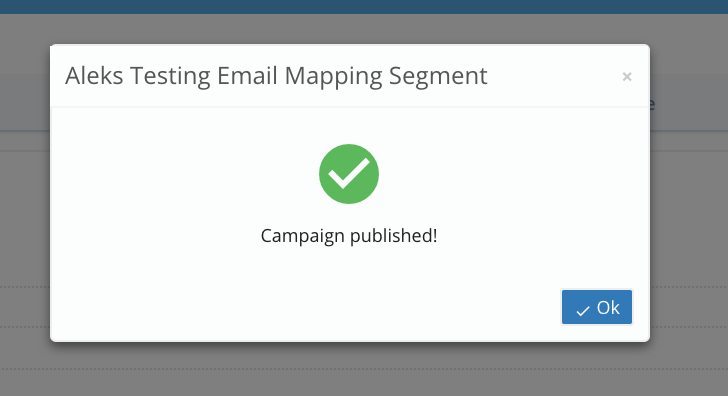 Lastly, your campaign could still be pending if you are targeting newly uploaded email segments. Segments that target email based data still take 7-10 days to process to find and match the cookies associated with those people. We recommend launching campaigns targeting email segments early so that the email data has time to process. Your creatives are being shown to your selected targeted segments for any particular campaign, on the websites they visit after visiting your site (or via email mapping). We automatically don't show ads on any "adult content" websites, but otherwise, the ads will bid to appear wherever one of your users is most likely to see and engage with it. If you want to block any particular sites from displaying your ads, just let [email protected] or your dedicated Customer Success Manager know. See more information on where ads appear in this article: Why am I not seeing my ads?